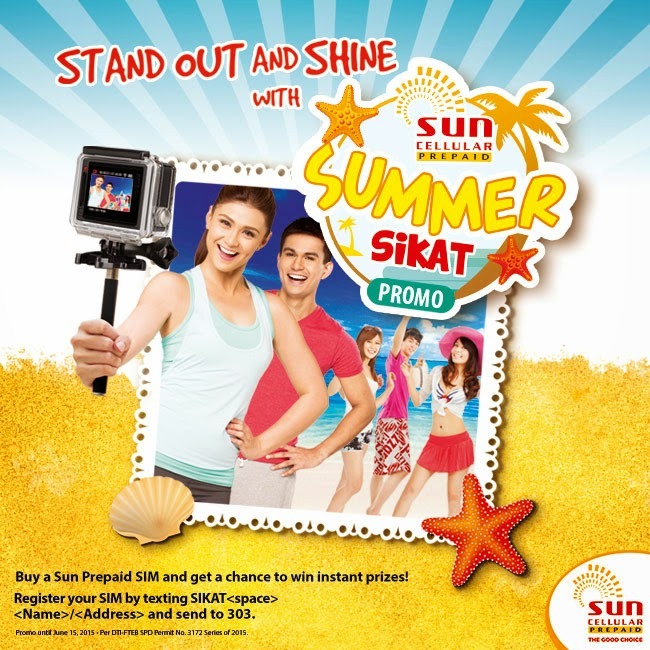 Win Instant Prizes with SUN Prepaid's #SunSummerSikat Promo! Could you feel the heat? Yeah, it's definitely ON! This Summer, SUN Prepaid subscribers Stand out and Shine with #SunSummerSikatPromo! All prizes are perfect for Summer right loves? I've long wanted to get a hold of that Go Pro Hero 4 Silver to capture all our family's Summer adventure, then share it on social media using a new Sony Xperia Z2 after topping up my Sun Prepaid account with Sun Prepaid load! Then go to Lazada Mobile App using my Sony Xperia to purchase a new swimsuit or other swimming accessories using my Lazada Discount vouchers! Wow! Super sarap talaga mag-imagine and daydream about these exciting prizes from Sun Prepaid! But this dream (of yours and mine) may turn into reality with #SunSummerSikat Promo! It's so easy to join loves! Register your newly activated SIM by texting SIKAT<space>Name/Address and send to 303. For the gadget prizes, subscriber will need to wait for a phone call from a Sun customer service representative. For the load prizes and online discounts, a unique code along with the redemption procedure will be texted to the subscriber. Promo will run for 8 weeks from April 16-June 15, 2015. Per DTI-FTEB SPD Permit No. 3172 Series of 2015. For more information about the Sun Prepaid #SunSummerSikat Promo and to know more about its Terms and Conditions, visit their WEBSITE or Like SUN Prepaid on FACEBOOK. do you need to put on sunscreen? It's spf30 already. :) Thanks. i'm using belo whitenig soap-pink. can i use the belo kojic immediately? without discontinuing the belo whitening-pink? If it's both whitening soaps, I think you should use just one. Unless you use the other one for other parts of your body, I guess that's okay. :) It worked for me when I used it solely. People keep on noticing how fair I got, but on a natural kind of way. Thanks. Hi mommy louise.. saw your blog and read it. I was so amaze for the effectivity of belo. Now po kase i'm using belo essentials ance pro. Dati wala naman ako pimps or the hate one acne. Nitong year lang nagkaroon. Kahit di month of period. I just wanna ask since you are a beauty blogger na rin.. can i use po yung soap na orange na belo and after yung acne pro as my toner and after that yung intensive whitening na cream ni belo? Just want to know lang po. Although same na belo.products po. Hope you find time po to answer this coz i really want po to get back my face. 😞 thanks po and God bless.